Visit the Candidate Manager and find the candidate you want to email. Click "Email Candidate", located in the Action menu, like this. This will take you to the candidate actions page with the "send email" area checked. Type up your email and click "Update" at the bottom of the page to send it. JobScore stores a copy of every email you send. All emails are all accessible by everyone (there are no private emails) and you can find them by clicking on a candidate and then into their "emails" tab. When you email candidates through JobScore the responses will be sent to the user you select in the "from field" and candidates' responses won't be automatically captured in JobScore - they'll come to that person directly. 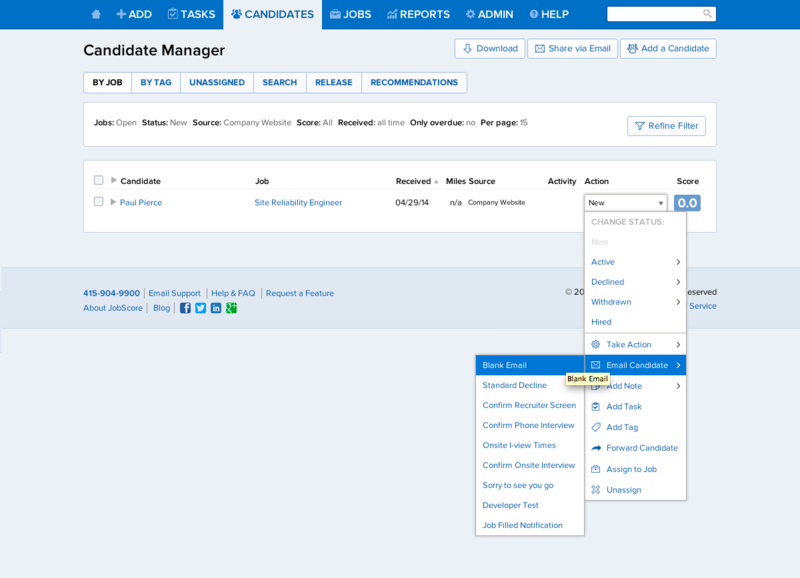 If you want to capture candidate responses and additional correspondence in JobScore, you'll need to use our email tracking feature and your bcc@inbox.jobscore.com inbox. Learn more about Email Tracking.